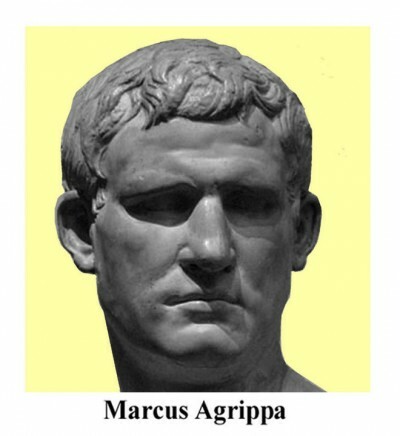 Marcus Agrippa was a close childhood friend of Octavian. They were inseparable over the years, with Agrippa becoming his great military strategist and commander. Without him, Octavian might never have become Caesar Augustus. Agrippa was born in a town nearby Rome. His family was not high in status according to the historical record. However, it was high enough that Agrippa attended the same school in Rome as Octavian in their early years. They were the same age and received their togae viriles together. Agrippa was physically tough and must have, at times, provided protection for his friend, Octavian. In 46 BC, Agrippa and Octavian joined Julius Caesar in Spain and served with him in his campaign against the remnants of Pompey the Great’s army led by his two sons, Gnaeus Pompey and Sextus Pompey. It was during this time that Caesar became even more highly impressed with his young great-nephew. When Caesar returned to Rome, he changed his will. Unknown to Octavian, Caesar left him most of his personal wealth and adopted him as his son upon his death. Then Caesar arranged for Octavian and Agrippa to go to a military camp in Apollonia, Illyricum (current Albania), to further their education and get high level military training. Six months later, Agrippa was at Octavian’s side in Apollonia when they learned of Caesar’s assassination. In the following years, Agrippa led Octavian’s armies to victory in the battles of Perusia, Naulochus, and Actium. Also, in 40 BC, though not a major battle, his victory over Mark Antony’s soldiers at Sipontum was pivotal in helping bring Mark Antony to the bargaining table for the Treaty of Brundisium. In 34 BC, Marcus Agrippa demonstrated how highly civic minded he was. After having served as consul, he requested from Octavian and took the lower position of aedile so that he could clean up the city of Rome; repairing aqueducts, building baths and hundreds of fountains. He oversaw the effort to clean the sewers and was only satisfied when he could personally sail through them from the Forum down to the Tiber River. Using his own money, he supplied the Roman people with olive oil, salt, and other foods; let them use the baths free of charge; and paid for their haircuts, men and women alike, for a year. In 27 BC, he built the original Pantheon which was later destroyed in a fire. The emperor Hadrian rebuilt it in 126 AD and had Agrippa’s name inscribed on the face of it; “M-AGRIPPA-L-COS-TERTIUM –FECIT” in Latin which translates to “Marcus Agrippa, son of Lucius, Consul for the third time, built this”. The Pantheon stands intact in Rome today as one of the most impressive and beautiful structures of these ancient times.